Businesses all over the world rely on Sinefa to power their network. Sinefa is the only network traffic visibility solution to use Live 1 second technology to find a resolve network issues instantly. Get set-up in minutes, not weeks, and access real-time insights in an easy-to-use dashboard. 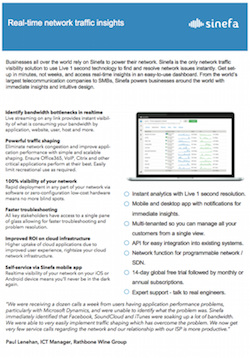 To learn more about the benefits of working with Sinefa, download our Real-time network traffic insights brochure.